When looking for a Sling Chair Patio Dining set for Four, you will find many examples. We will look at five in this article to give you an idea of what is available. Each will have a dining table and four chairs with sling fabric for seating. I like this fabric as it dries quickly after a rain and is comfortable for long term sitting without cushions. I have several chairs with this material that have been outside for more than 10 years with little or no care. I do store them during the harsh winter months to keep them looking like new. The little outdoor critters have not chewed on this fabric like they do the cloth seat cushions of more expensive dining sets. Now lets look at some of the details of each set and see if one will work for your patio or balcony area. I have a very similar set that is four years old and still looks like new. I like this set because it does come with an umbrella also that matches the fabric in the chairs. This umbrella does not have a tilt feature, it will only sit straight up. It can be lowered by pushing a button and pulling the canopy down. The 34 inch square table has a tempered glass top and lower support for the umbrella. No umbrella base comes with this set, you can see what I use for an umbrella base in my article here. The table does not fold up for storage. The chairs will fold for easy storage when not in use. I fold them and store them on the table top in the shed when not needed. It is easy to carry out to the patio area and set up in minutes for a meal or just to sit around and have a few adult beverages. This set will come in several fabric colors to match most outdoor decors-Blue, Gray, Red and Tan. The umbrella color will match the seat color for a great look. This set will work well for those looking for a low price and a set that is easy to store when not needed. 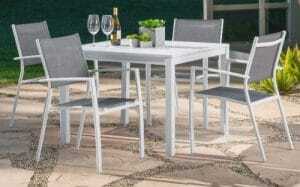 For more information on this Albany Lane folding patio dining set, see my article here. Very similar to the Albany Lane set above, this set will have a little more style in the chairs and a bigger table, this square table is 38 inches across. The chairs will have a lattice design filling in the top portion of the chair frame. 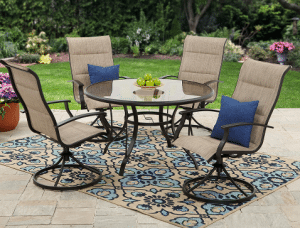 This set will only come in the tan color shown, if you need other colors to match your outdoor decor, the Albany Lane set will work better for you. The chairs will fold for storage, they have a locking tab at the back of each leg that has to be opened to fold the chairs. Table will have a tempered glass top with a lower leg support frame that has a hole for an umbrella. 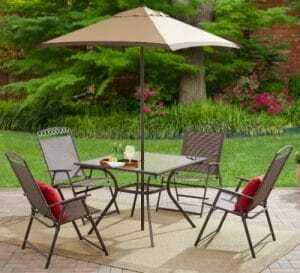 Umbrella is included in this set also, the canopy color will match the sling fabric on the chairs. No umbrella stand is included in this purchase. If you need a bigger table or like the higher end style of this set over the Albany Lane, this set will work well for you and be easy to store when not needed. Looking for more seating comfort, this set will have swivel chairs with a poly padding inside two layers of sling material. The round table will have provisions for an umbrella, it is not included in this set. The table will be 48 inches across, with the swivel chairs this set will need more floor space to fit comfortably that some of the others in this article. A tempered glass table top will give you a nice surface for you dining or drinks. Chairs will have a round base and post connecting the base to the seat portion, this will give you 360 degrees of motion if needed. The post will be mounted to the base of the seat with a spring type of mount, this will give a little forward and back motion, not a rocker. The cushion material is a poly material inside two layers of sling material, like a sandwich. This makes for comfortable sitting, it will not dry very quickly after a rain or washing with a hose. This set will work great for those looking for more seating comfort and a bigger table. For more of my information on the Highland Knolls dining set, see my post here. 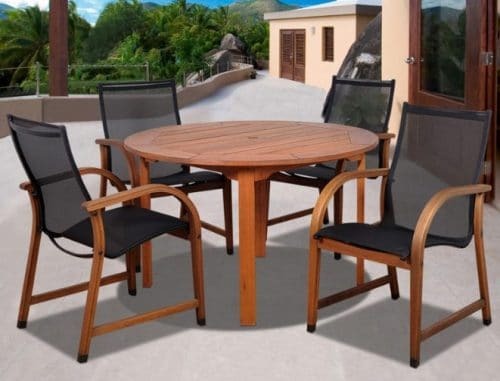 Looking for more of a high end dining set for your patio, this elegant Eucalyptus wood set will last a lot of years and still look like new if you take care of it. Just put on a coat of tung oil once a year and the wood will remain the bright color and will look like it did when you purchased it. The round table will have a center hole for an umbrella, not included in this set, no provisions for a lower umbrella support. Top will be a slat design with a set of boards around the border. Four straight legs will support the round table top that is 47 inch across. Chairs will have an Eucalyptus wood frame with black sling material for seat and back. The arched arms will flow to the front legs for a smooth look. No motion in these chairs. Two chairs can be stacked if the one on top is turned upside down, this will save some space when you store this set in the winter. A free wood care kit will come with your dining set to help you keep it looking like new. This set will work best for those looking for a higher end dining set or one made of wood that will last many years. The clean lines of this modern looking set will give you a bright look to your outdoor dining area. With a 38 inch square table and four stackable chairs, this set be used in tight areas well. Made from light weight aluminum with a white powder coating, this patio set will be easy to move and store when needed. Square table will have four straight legs and a slatted top. No hole for umbrella is included in this table. Chairs will have the same white frames with a gray sling fabric for seat and backs. No motion in these chairs for extra comfort. The sling material will dry quickly after a rain shower. This set is for those looking for clean lines and simple moving or storage. Little care will be needed with the aluminum frames and sling fabric. 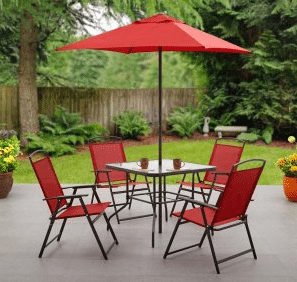 You have a lot of options when looking for the right Sling Chair Patio Dining set for Four for your patio or balcony area. From the small folding sets to the bigger sets with swivel chairs, one of these sets could work well for you. I have the folding set at my camper at my lake property, we use it whenever we eat outside. It is easy to set up and put away when we are done. I also have a round wrought iron table on a patio in the backyard at home, it has four sling chairs that have a “S” shaped frame for the legs to give a little motion. 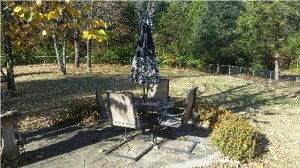 I have had real good luck with this type of patio furniture and not a lot of work to keep it clean. The chairs in the yard have been there for over 10 years, I do store them in the harsh winter weather in a shed. I would like to try the Eucalyptus set in the future, as it will last a lifetime with proper care. I like the looks and the sling material will last a long time. If you have anything to add to this article or just have a question, drop me a line using the forms below and I will get back to you shortly. I was looking for a dining set and here they are! The Harper Dining Set is my favorite. I love its simplicity and clean lines. Another plus is its weight. One question, John: is the fabric the chairs are made of, sensitive to humidity or direct sunlight? We don’t have any storage room and the set will be left outside with rain and sun. Will it make it last a few years? I have several sets of sling chairs that have been outside for over 5 years, one set over 10 years. They still look like new. Sun has not faded the fabric or the rain has not soaked in. I do store during the harsh winter snow. I like this fabric, you do not need cushions to keep you comfortable for long term sitting. 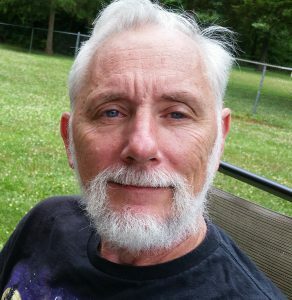 I am sitting in one on the front porch now as I type this that is over 5 years old and looks new. "My reviews are based on my own personal experience and research. When you buy something from this website, I may receive an affiliate commission." Be the first to get my new articles. Data found will be sent to your Email address and will allow you to put in an additional request to have data anonymized. Once a week we send a digest with the most popular articles.